How to draw a lattice for the divisors of big numbers? An exercise ask to find atoms and join-irreducible elements for the set of divisors of 360. I know how to find them by drawing the lattice but it seems difficult in this case. Is there another way to find atoms? If not, is there a easy way to draw such a lattice? Let $d=p^k$ be a divisor of $360$. Then $d=a\vee b$ implies $a=p^k$ or $b=p^k$, so $d$ is join-irreducible. Conversely, let $d$ be a join-irreducible divisor of $360$ and write $d=a\times b$ with $\gcd(a,b)=1$. Then $d=a\vee b$ and hence $d=a$ or $d=b$, meaning that $b\mid a$ or $a\mid b$, respectively. This holds for every factorization $d=a\times b$ and hence $d$ is a prime power. The atoms are the numbers with no nontrivial proper divisors, i.e. the primes. Not the answer you're looking for? Browse other questions tagged discrete-mathematics lattice-orders integer-lattices or ask your own question. How does the base in the complete lattice from a given topology look like? How is a complete lattice defined solely by a least-upper bound? Lattice divisors of 165, ordered by divisibility. Draw Hasse diagram, get complements, check if distributive, check if Boolean. 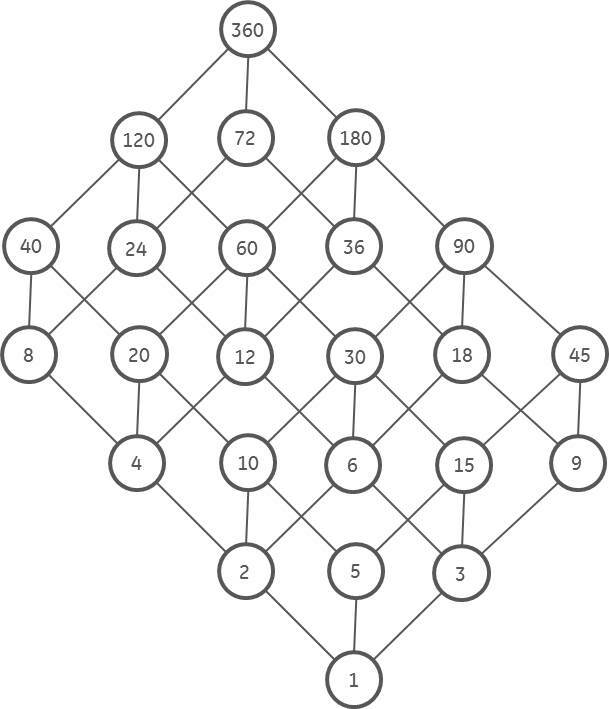 Lattice divisors of 150, ordered by divisibility. Draw Hasse diagram, get complements, check if distributive, check if Boolean.